Our tough nylon Mountain choke Dog Collar works great for long haired dogs. . The 13mm rope is about the size of a fat kindergarten color. For correct size please measure your dogs neck and add at least 2 to 3 inches. The size of this collar includes the rings from end to end. 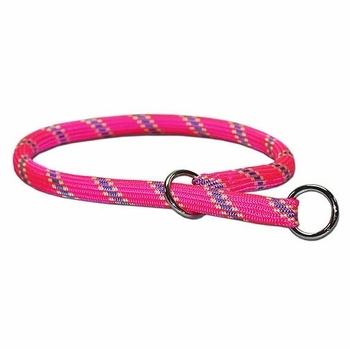 The 13mm choke collar is available in Sizes 22, 24, and 26 and in 4 colors, Black with stripes, Blue with stripes, Red with stripes and Pink with stripes.